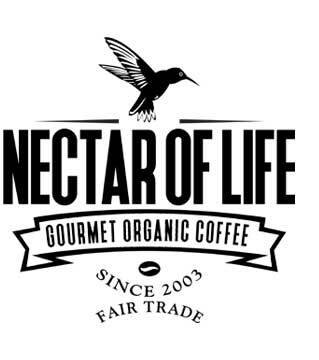 As you may know, we at Nectar of Life, www.Nectar-Of-Life.com, specialize in fairly traded, certified organic coffees, but what you may not know is why we are so passionate about organics in general. Let me start by sharing a bit about the educational path that led me to found Nectar of Life Organic Coffee Company. I began college with the intent to enter the world of horticulture with a desire to grow chiles! As with any science based degree, there is a required amount of chemistry required. Once I started chemistry classes I was hooked. Chemistry explains so much about the world we live in. Although my love of horticulture remained, I deviated from the world of plants to major in chemistry and chemical engineering. My studies at the University of California at Davis (UC Davis) lead me to conducting advanced research into inorganic bio-chemistry. That's right, inorganic bio-chemistry, sounds like an oxymoron, right? This discipline involved inserting metal atoms into carbon atom cages called Buckminsterfullerenes, or Buckyballs. What I learned during this time would make most anyone want to avoid chemicals and nanoparticles at all cost. We were dealing with complex particles that were small enough to penetrate any cell. Due to the utter terror that comes from the knowledge of how nanoparticles can infiltrate virtually every cell of the human body I decided to venture back toward the agricultural field and majored in Viticulture and Enology, the virtues of vino. It was during the course of taking varied plant biology and biochemistry classes that I came to truly appreciate the intricate beauty of the plant world. I also learned about genetic manipulation and petro-chemical based fertilizers. A library can be filled on the research performed by Monsanto alone, but I digress. Now, back to organic coffee. By definition, foods labeled certified organic in the United States cannot be genetically modified. This is one of my main concerns regarding food. Many foods in the United States are genetically modified, and there is no law dictating that you, the consumer be informed about these genetically modified organisms (GMOs). As of 2011 nearly 75% of corn planted in the US was genetically modified. For you vegans supplementing your protein with soy, guess what, nearly 95% of soybeans planted in the United States are genetically modified (USDA, 2011)! I will not go into the myriad forms of genetic modifications performed on plants, but one of the most "successful" was Monsanto genetically engineering corn to resist an herbicide THEY MANUFACTURE. GMO's are relatively new, and there is no real tracking system in the US to know what the long-term health affects will be. I for one, do not want to be a part of a massive epidemiological study to find out. For the farmer, not being able to use synthetic pesticides and fertilizers will require more work, but also involves much more attention to the coffee trees. This close relationship with the crop may result in higher quality coffees. An added benefit for the farmer is not being exposed to toxic chemical residues. This not only helps the farmer, but their family and the community. There have been numerous studies that correlate disease and long-term health problems with exposure to pesticides used in agriculture. Pesticide exposure can be harmful in the best of situations, but in developing countries the outcome can become deadly (Ecobichon, 2001). In the United States, farming and synthetic fertilizers go hand in hand. Without the use of synthetic fertilizers we never would have become the great producer of food that we are. Petro-chemical fertilizers are a powerful source of nitrogen which promotes rapid vegetative growth. Without the use of synthetic fertilizers, coffee growers have to do things differently. They must mulch and compost plant matter. This process mandates re-using coffee tree and other crop cuttings instead of burning them. This process helps maintain a healthy soil and sustainable environment. With conventionally grown crops farmers are in a battle to increase production and reduce costs - at all costs. With coffee and other crops there is a history of slashing and burning vegetation. They do this to open up the land to plant coffee in rows for mass production. This results in nutrient rich top soil being washed away, which creates an endless spiral of having to add synthetic fertilizers to grow the coffee. Mass deforestation and organic farming do not go hand in hand. Organic coffee may cost more, but it helps preserve the rainforest and tends to be much higher quality than coffees that cost a few cents less. Many organic coffees are grown at high elevations in shaded conditions. High elevations and shade contribute to a slow developing coffee, especially in the absence of synthetic fertilizers. Coffee beans grow denser and more complex than coffees grown at low elevations in direct sun. Not only does organic coffee production preserve the environment, but results in better coffees*! A couple items that correlate with complex flavor development in organically grown coffees are antioxidant and nutrient accumulations. 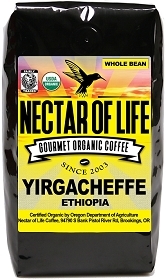 Some of the complex and intense flavors associated with organic coffee can be attributed to being shade grown*, but there have been numerous research studies that show that organically grown foods contain higher levels of antioxidants and nutrients (Mitchell and others, 2007; Wang and others, 2008). There have been other studies that directly correlate better flavor with organic farming practices (Weibel and others, 2000). Although there have not been extensive studies comparing the phenolic content of organic versus conventionally grown coffees, it stands to reason that coffee would follow the same trend as other organically produced crops. It is well known that coffee contains loads of antioxidants, which may provide many health benefits. It is our belief that organically grown coffees present the best possible solution for easy consumption of these various antioxidants. Not only are antioxidants higher in organically grown crops, but you don't have to worry about toxic pesticide residues or genetically modified organisms. Above, we have outlined the major benefits of organic coffee, but for us organic coffee is much more. 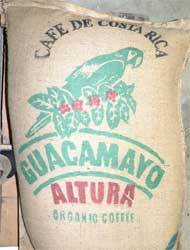 There are numerous cultural and social implications which come with exclusively roasting certified organic coffees. We hope to provide a statement that causes change, that and providing our customers with the freshest, most flavorful organic coffees possible. 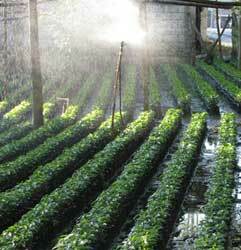 * - There are estate-grown, gourmet coffee farms that use shade-grown coffee techniques. 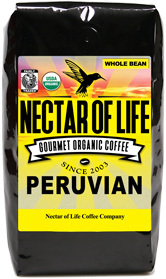 These farms may not use organic farming practices, but do produce flavorful coffees. Ecobichon, Donald, J., 2001, Pesticide Use in Developing Countries, Toxicology, Volume 160, Issues 1–3, 7 March 2001, Pages 27-33. United States Department of Agriculture (USDA), 2011, "Adoption of Genetically Engineered Crops in the U.S.", http://www.ers.usda.gov/data/biotechcrops/. Wang, Shiow Y., et al., 2008, Fruit Quality, Antioxidant Capacity, and Flavonoid Content of Organically and Conventionally Grown Blueberries, J. Agric. Food Chem., 2008, 56 (14), pp 5788–5794.